Yes. It is SUMMER time. And SUMMER time requires some wonderful Summer Paper Crafts. 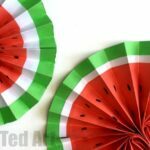 With July 4th just around the corner, we thought we would rework out Melon Paper Fan DIY and make some fabulous 4th of July Paper Fan DIY for you. The best bit? 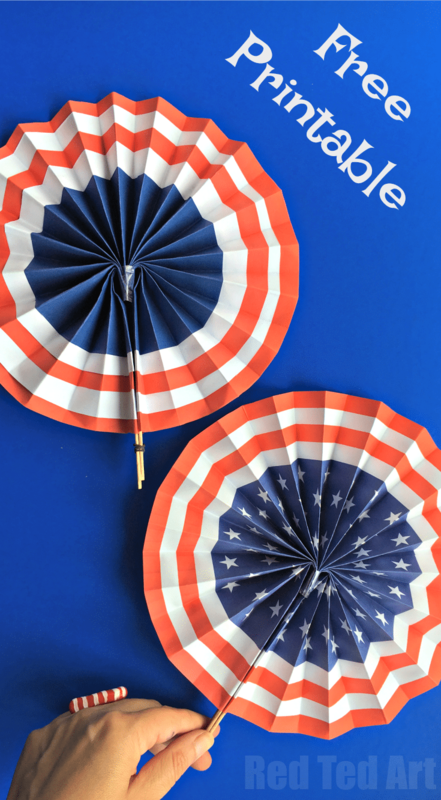 You can either make this Independence Day paper fan from SCRATCH or you can make use of our handy 4th July printable. Your call! Totally depends on how much time you have and how crafty you are feeling! But we do think that this DIY Paper Fans Template is super handy! 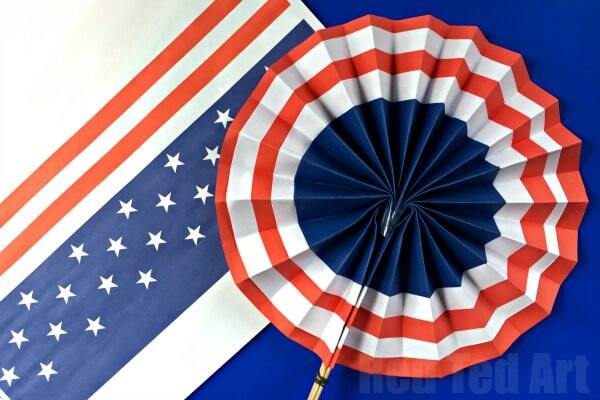 ALSO, these paper fans, work fabulously as paper Hand Fans for kids OR make them exactly the same way, but hang them up as Patriotic Wall Decorations – they make wonderful Red Blue and White Rosettes. 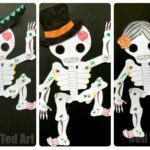 Great for decorating large areas.. the kids can make them and you hang them! 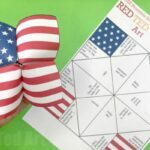 The perfect American Flag Craft for 4th July! So. 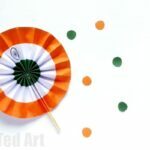 These paper fans are a great kids craft and wonderful to keep cool with, but can also be used as paper fan decoration ideas. Make one. Make many. Your call. 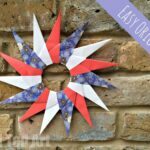 They look fabulous as 4th July Paper Rosettes on your walls too. 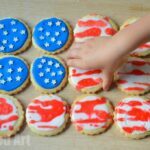 You may also like to check out our VERY EASY 4th July Cookies for kids to make! Don’t they look lovely? I just love the classic Red White and Blue decorations! Once again, you can choose to watch the how to make paper fans on a stick video OR you can follow the written step by step instructions below. The written instructions below are for use with the free paper fan printable. I hope you find the step by step paper fan making instructions useful! 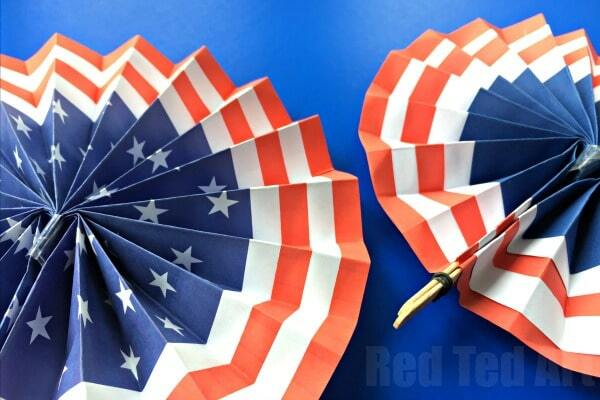 Begin by printing out the free DIY Paper Fans Template. There are two to choose from – the plain, blue, red and white or the one with white stars too. Be sure to select the correct one before you hit print. Then print 3 sheets of the one you wish to use. Cut out your three paper printables. Stick them with a little glue stick together, to create one long strip of paper. 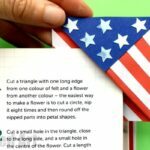 Now start folding this longer paper strip into a concertina. Once finished, take a little tape and secure the bottom of your concertina with some tape. Take one popscicle stick. Add lots of pritt stick to BOTH sides of the lolly stick and insert into one end of your paper fan. Make sure an inch/ 2-3 cm sticks out at the bottom, if you want to use these as paper hand fans. Repeat with the second popscicle stick on the other side. Now carefully open up your fan. And DONE! There are SO many uses for these, you can adapt these DIY Paper Fans for Weddings (make them in white or the wedding colour scheme), as mentioned they look great as paper rosettes hung on the wall too – making gorgeous hanging paper fan decorations. Or of course use them as lovely DIY paper hand fans. 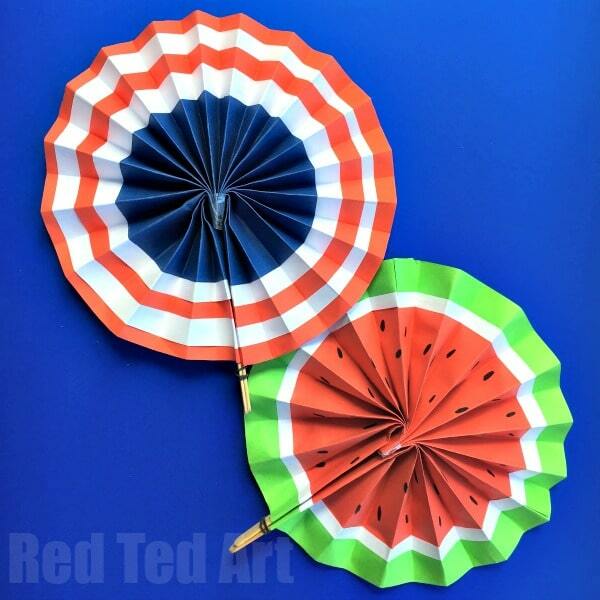 We also adore the DIY Melon Paper Fan version too. 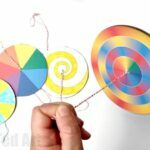 I hope you enjoyed this step by step how to make paper fans with popsicle sticks! Such a thrifty and easy Paper Craft for Summer!